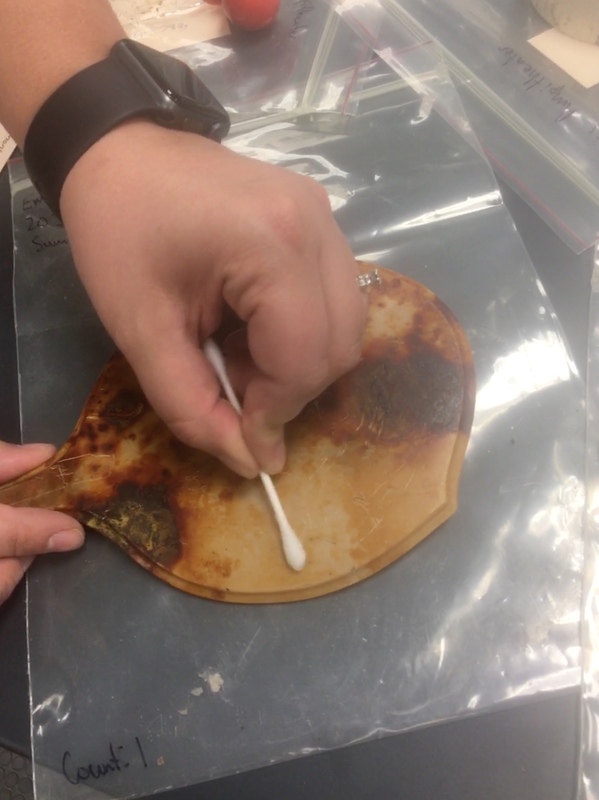 Last week I spent some time in the CAP lab with Campus Archaeologist Lisa Bright resorting and accessioning artifacts from the 2008 and 2009 Saint’s Rest rescue excavation. This excavation uncovered many ceramic artifacts (among other items) including plates, bowls, and serving dishes. 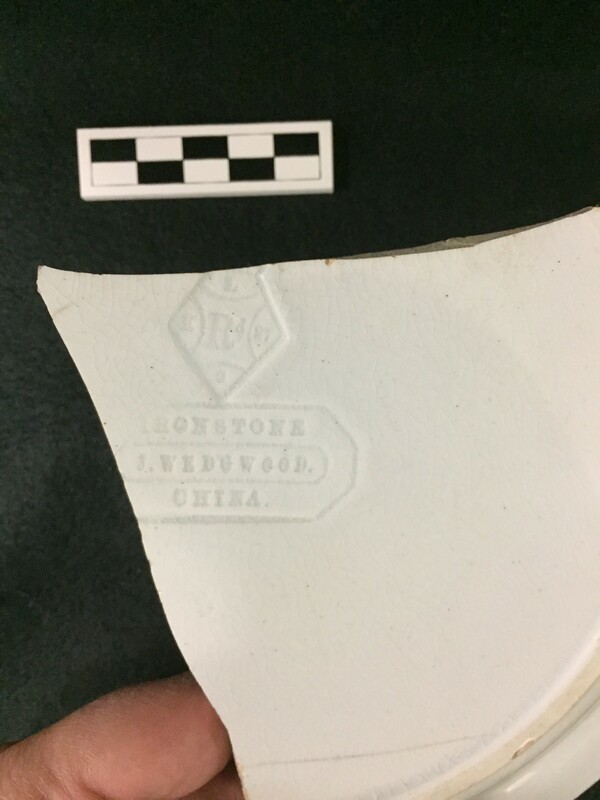 Among the many fragments of whiteware, Lisa showed me one fragment that stood out: part of a plate, embossed with a pattern of figs and bearing a Wedgwood maker’s mark. If you’ve ever found yourself deep in the throes of an Antiques Roadshow binge-watching spiral, chances are you’ve heard of Wedgwood china. 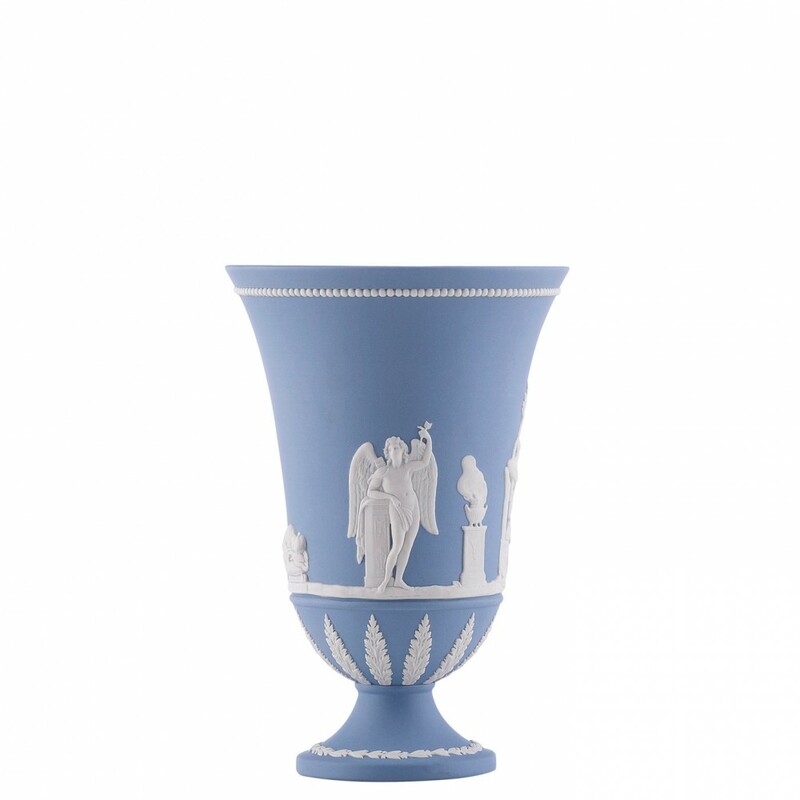 Perhaps you’ve seen pieces of Wedgwood’s iconic blue jasperware decorated with Greek figures in white bas-relief. Or, perhaps you’ve seen one of Wedgwood’s Fairyland Lustre Art Nouveau vases, opulently adorned with jewel-toned elves and dragons. Since the founding of the company in 1759, Wedgwood has graced the tables of such dignitaries as Queen Charlotte, consort of King George III, Catherine the Great of Russia, and President Theodore Roosevelt (1). And, as the Saint’s Rest bowl fragment indicates, Wedgwood also graced the tables of MAC. For my blog post, I researched Wedgwood to get a better idea of how a piece of the ceramic dynasty made its way to our campus. The story of the CAP Wedgwood begins in the 17th century in the rural English county of Staffordshire. The soil in Staffordshire wasn’t much for farming, but the region was rich in clay, salt, lead, and coal – key ingredients for making pottery. The use of coal for fueling kiln fires gave Staffordshire potters an advantage over other rural workshops that still depended on timber for fuel (2). For centuries, Staffordshire was known as a prominent center for pottery production and innovation. 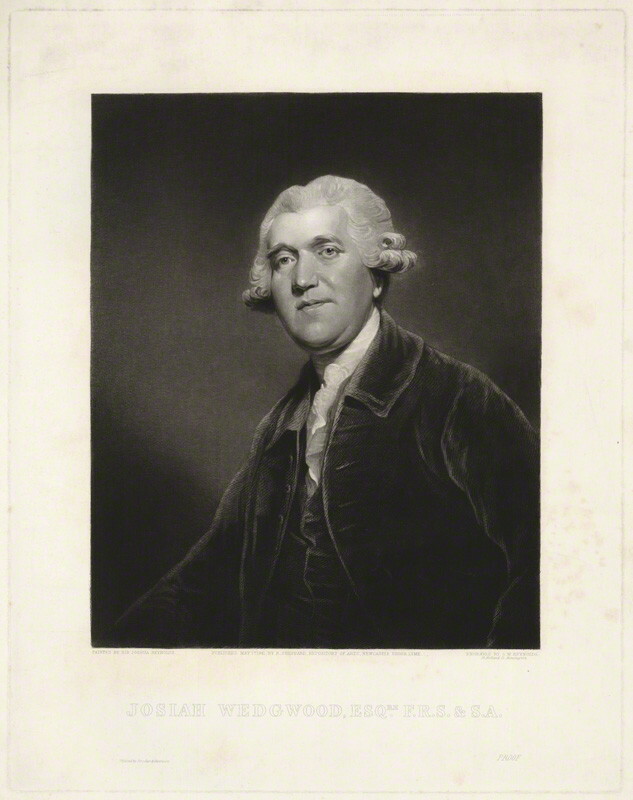 The Wedgwood dynasty began with a Staffordshire potter named Josiah Wedgwood (1). Born into a family of potters, a leg amputation left Josiah unable to work as a “thrower” in his family’s workshop (3). Instead, he developed an interest in experimenting with formulas and design. Wedgwood developed a durable, attractive, cream-colored type of earthenware that gained favor with Queen Charlotte (3). The serving set he made her pleased her so much, Charlotte agreed to allow Wedgwood to call himself the “Queen’s Potter” (1). This celebrity endorsement set Wedgwood’s sales booming. Over the years, Wedgwood continued to innovate. He developed two new types of stoneware known as Black Basalt and Jasperware (3). Both are known for their matte, biscuit finish. Jasperware was produced in a variety of colors, though light blue was the most iconic. White ornamental appliques were molded separately and baked onto the pottery in emulation of Roman cameo glass vases. In 1773, Wedgwood developed a method of transfer printing enamel (4). This decorative technique reduced inconsistencies, eliminated the need for hand-painting decorations, and gave customers a wider array of customization options (3). Perhaps Wedgwood’s greatest innovation was as a businessman. Wedgwood sold his products via printed catalogs and advance orders (5). Since he knew which pieces his customers wanted, he was able to reduce waste and therefore costs. So how did we get from the elegant designs of the Staffordshire Potteries to the humble piece of CAP Wedgwood? The answer is in the design: white ironware, to be precise. Wedgewood plate base with makers mark and RD stamp. The ceramic game changed in 1813 when a Staffordshire potter developed a new type of vitreous pottery dubbed “ironstone china” or, sometimes, graniteware (6). In the 19th century, ironstone quickly gained popularity as a cheap, mass-producible alternative to porcelain. It was especially popular in the America. In the 1840’s, undecorated white ironstone headed for America comprised the largest export market for Staffordshire’s potteries. In contrast to England, where customers favored elegant designs, American consumers preferred plainer tableware (6). In the 1850’s and 60’s, however, English potteries (including Wedgwood) decided to introduce some whimsy into the American market. Potteries began embossing designs inspired by the American prairies. Stoneware from this era were commonly embossed with grains such as wheat, corn and oats, or fruits such as grapes, peaches, berries, and— like the CAP Wedgwood—figs. Because of its durability and popularity in rural America, this china became known as “farmer’s” or “threshers’” china (6). So, there we have it. 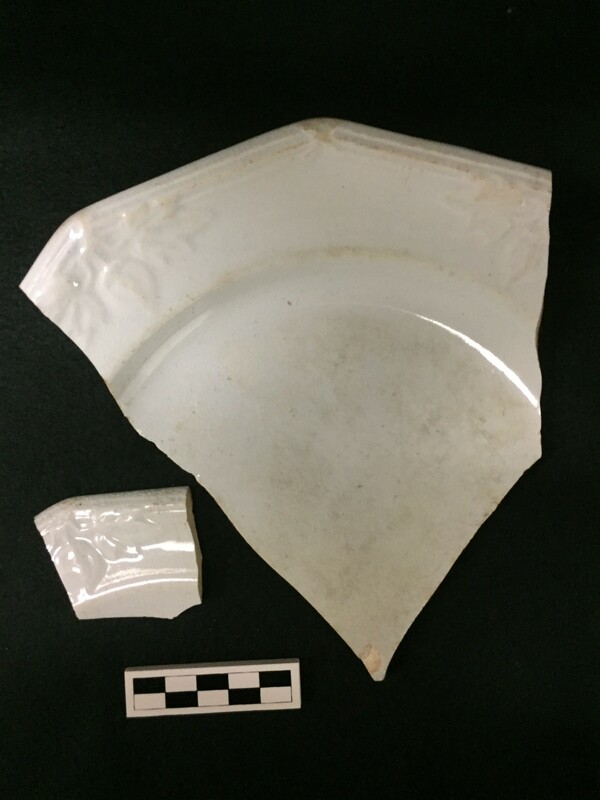 The CAP Wedgwood fragment from Saint’s Rest may have made its way to campus as a piece of thresher’s china. Its durable form and folksy fig design likely appealed to someone living at a rural Michigan college. In parting, I’d like to leave you with some (non-alternative) facts about Josiah Wedgwood, a fascinating figure in his own right. Fact 1: We may have Josiah Wedgwood to thank for theory of evolution. Wedgwood was the grandfather of both Charles Darwin and Darwin’s wife, Emma (7). Inheritance from the Wedgwood fortune is often credited for allowing Darwin the leisure time to sail on the S.S. Beagle and formulate his theory of evolution. Fact 2: Apart from his pioneering efforts in the ceramics industry, Wedgwood was a prominent abolitionist (8). In the late 18th century, he commissioned and paid for a series of iconic cameo medallions that became the emblem for the abolitionist movement. 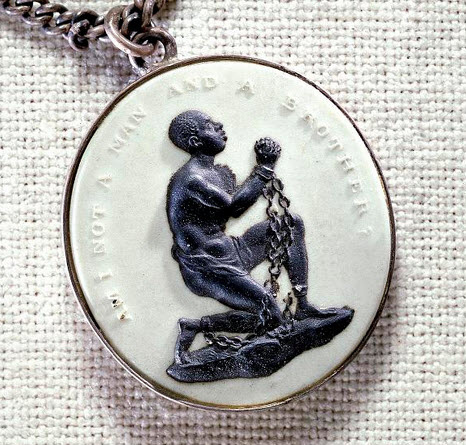 The design depicts a kneeling slave beneath the inscription “Am I not a man and a brother?” The figure is prepared in Wedgwood’s own Black Basalt against a white background. It became fashionable for men and women to wear these medallions, which helped popularize the abolitionist cause. For most people, Detroit is known as the Motor City. With the big three companies situated around the city, Detroit is a proud producer of automobiles for customers all over the world. However, what people don’t know is that cars aren’t the only product that Detroit was once famous for. Even before the first Model T rolled off the assembly line and on to the city streets, Detroit was known as the “Stove Capital of the World.” Because of Michigan’s abundance of natural resources, the 19th and 20th century would prove to be an industrious time period for Michigan; the large amount of cast iron stoves produced in Michigan during this time is a clear indication of this. There were many stove producing companies within the state, but the “big three” included the Detroit Stove Works, Michigan Stove Company, and the Peninsula Stove Company.  So why is this important? As you may already know, the Campus Archaeology staff spent part of this past June at the Saints’ Rest site, digging under the sidewalks and eventually expanding to a trench. Saint’s Rest was the first dorm to be used on the MSU campus, and it stood between the years 1856 and 1876, until it (sadly) caught on fire and burnt to the ground. The site was first excavated in 2005 by CAP, and we have continued working on it since then. This summer, we were thrilled to discover a piece of a (very rusted and burnt) stove door at the Saints’ Rest site. It’s not very large, and with the large amount of rust on it it’s hard to make out many features. However, we do know it says “Detroit Mich” on the center of the door, and the number 25 is on the bottom edge. Because Saints’ Rest burnt down in 1876, we know that the stove had to have been manufactured and used before 1876. This is interesting, because the Detroit Stove Works wasn’t founded until 1864, and the Michigan Stove Company was founded in 1874. This probably means that the stove we found on campus was probably one of the first stoves to be made in Michigan for it to have been on campus the day Saints’ Rest burnt down in 1876. 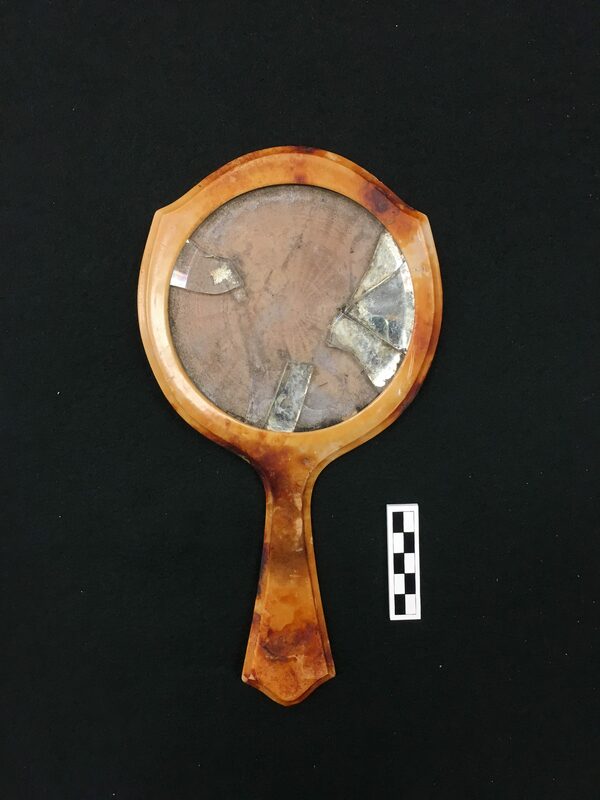 This is one of the coolest parts about historical archaeology. We can take written and recorded accounts of what was going on at a certain point in history and compare it to the artifacts we find. This comparison then helps us to fill in the gaps between what is written and what is found. The stove door we found is an example of this. From the writing on the door, we know it was manufactured in Detroit, Michigan. 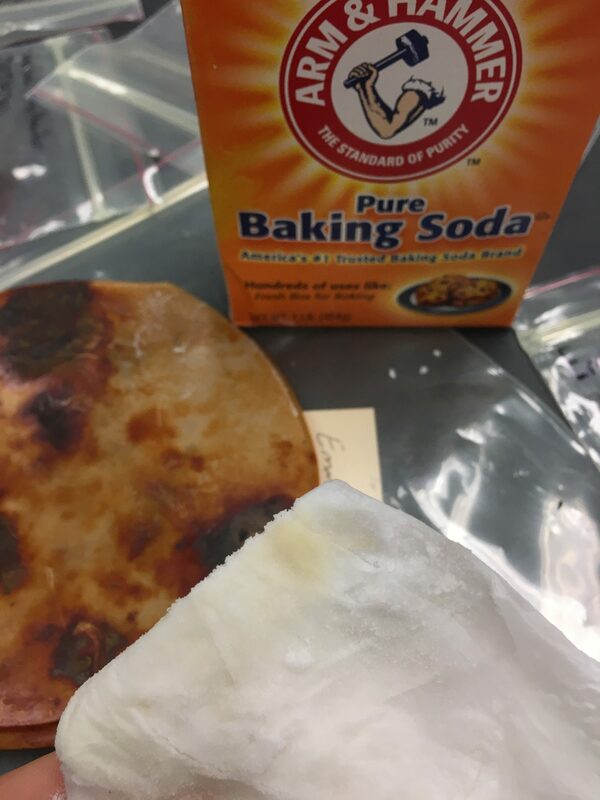 From there we can figure out that it was probably made from either the Detroit Stove Works company or the Michigan Stove Company. We also know the stove lived a short life – it was manufactured in the late 1860s to early 1870s, and was then burnt down with the rest of the building it resided in during the Saints’ Rest fire of 1876. Of course, we’ll never know exactly what “life” this stove led, but from the information we do know, we can figure out the general idea of where it was made, who made it, and what became of it.